Osteoarthritis of the knee affects the medial compartment (inner half) of the knee most frequently. Quite commonly the medial compartment can become severely arthritic and the patello-femoral compartment and lateral compartment are well preserved with little or no arthritis. Less frequently the lateral or patello-femoral compartment can develop arthritis with rest of the knee remaining well preserved. If this is the case then patients can be suitable for a partial or uni-compartmental replacement whereby the severely affected compartment is resurfaced but the rest of the knee is left alone. For patients who are suitable for a medial uni-compartmental knee replacement then evidence suggests that the operation is as effective as a total knee replacement in relieving pain and the joint lasts for just as long as a total knee replacement. In addition the operation is less destructive as a much smaller amount of bone is removed to allow resurfacing of the worn out joint surfaces. 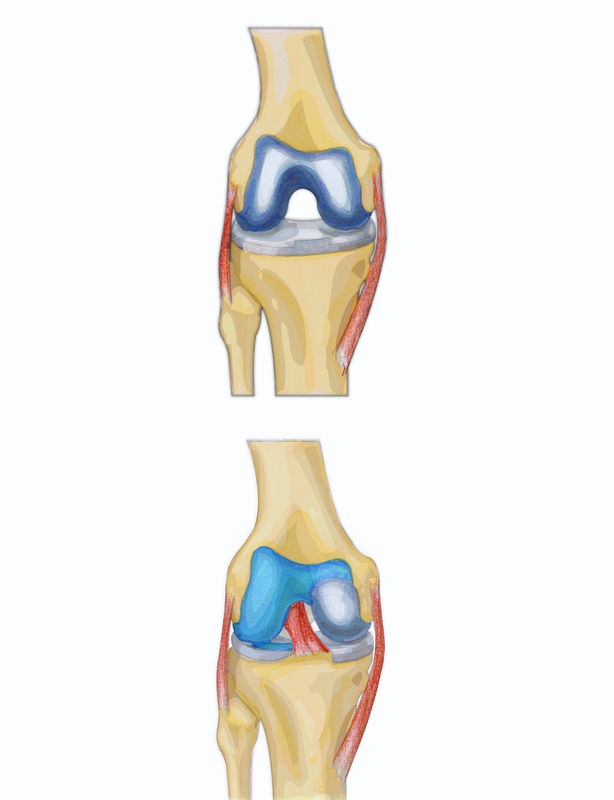 If the artificial joint wears out or has to be revised for any other reason then conversion of a uni-compartmental to a total knee replacement is relatively straightforward and little or no additional bone is removed above what would normally be removed for a total knee replacement. This is as opposed to revising a worn out total knee replacement to a revision knee replacement, which is a bigger undertaking and involves further loss of bone. Overall the risk/benefit analysis, the hospital experience and the rehabilitation programme are similar to a total knee replacement but with a number of practical and theoretical advantages for those suitable for a uni-compartmental knee replacement. Your consultant will explain in detail the options available to you. Arthritis can be diagnosed from plain x-rays. It may be necessary to obtain detailed information on the knee prior to surgery and therefore you may be asked to attend for an MRI or CT scan. Simple painkillers and anti-inflammatory medication will help most people with harthritis cope with symptoms before they become bad enough to require surgery. The operation is normally performed under a spinal anaesthetic as this is generally safer and provides excellent post-operative pain relief. Some patients are worried about being awake; however the level of sedation can be varied such that patients can be as awake or asleep as they wish. The operation involves an incision over the front of the knee and the patella and muscles attached to it are pushed out of the way to expose the joint surfaces. The worn out bearing surfaces of the knee are resurfaced with metal implants and a polyethylene bearing is inserted to separate the 2 metal components and provide a low friction bearing surface. In total knee replacement or unicompartmental knee replacement, the plastic bearing which sits between the two metal components may be fixed (a fixed bearing knee replacement) or mobile. A mobile bearing total knee replacement means that the plastic is not fixed rigidly to the tibial component, and can move around in a number of planes. Depending on the actual implant used this movement may take place backwards and forwards, sideways, rotation or a combination. Your consultant will explain the potential benefits of this technique for your individual condition. The benefits of these types of implants are still theoretical and laboratory based, but the idea is that there may be a reduction in the wear of the plastic and therefore the long term loosening. There are also some claims that function and range of movement of the knee may be improved. There is no solid evidence for this yet. A knee replacement is successful in relieving all or most or the pain from an arthritic knee in about 90% of cases. Overall greater than 90% of patients are happy with the result of their knee replacement. 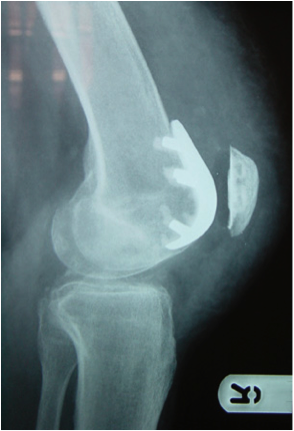 The reoperation rate for partial knee replacements is higher than total knee replacements. This is because they are generally used in younger patients and also because (by definition) other parts of the knee can develop arthritis (disease progression). The aim is to provide each patient with a knee replacement to last their life. Statistics suggest that 90% of knee replacements are still working well ten years down the line. However they are mechanical devices and will therefore wear out. The length of time a knee replacement will last in any one individual is very difficult to predict but a good analogy is that of asking how long a new car will last and of course this depends on how far and how well you drive it!